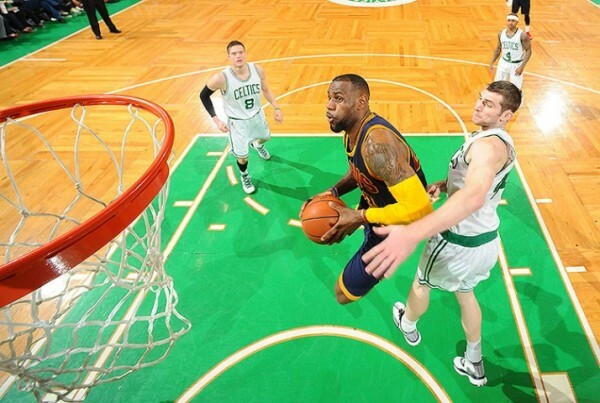 (Boston, MA) — In a very physical and hard-fought series by both teams, the Cleveland Cavaliers (4-0) knocked off the Boston Celtics (0-4) in Game 4 by a score of 101-93 on Sunday afternoon at the TD Garden, which concluded a four-game sweep of Boston in the first round. However, the win came at a costly price for the Cavs, who lost Kevin Love to a dislocated left shoulder in the first quarter after he got tangled up with Celtics power forward Kelly Olynyk. Love, who only played seven minutes and compiled two points (one of three shots made from the field), one rebound and one assist, was clearly not happy with Olynyk’s actions. Isaiah Thomas, who had 21 points, nine assists and five boards off the bench for the Celtics, responded to Love’s jab at Olynyk with a quote of his own. With the assumption that Love will miss some game time in round two of the NBA playoffs, Cavs head coach David Blatt will have to make some serious adjustments in his rotation. LeBron James, who led all scorers with 27 points, has all the confidence in the world in his coach. To say Game 4 was chippy is a massive understatement, as there were many hard fouls and one ejection in Sunday’s contest. Late in the second quarter with the Cavs ahead 51-32, Kendrick Perkins decked Celtics small forward Jae Crowder to the floor after setting a screen for James. Crowder did not take kindly to Perkins’ flagrant one foul, as he proceeded to get up in the big man’s face as the Boston crowd booed loudly. The bad blood with Crowder did not stop there, as J.R. Smith got in on the action. With 10:23 remaining in the third quarter and the Cavs up 57-36, Smith inadvertently backhanded Crowded right in the chops as the two tried to maintain position for an offensive rebound, which caused Crowder’s left knee to buckle beneath him. Smith, who was given a flagrant two foul and immediately ejected for the game, feels remorse for what happened to Crowder. In addition to James’ effort, three other Cavs recorded double-doubles as well. Kyrie Irving had 24 points, 11 rebounds and three assists, Iman Shumpert came off the bench to record 15 points, 10 rebounds, three blocks and two steals, while Timofey Mozgov had 12 points, 11 boards and three blocked shots. For the Celtics, former Ohio State University power forward Jared Sullinger came off the bench to contribute a double-double with 21 points and 11 rebounds, while shooting guard Avery Bradley was the only starter for Boston to score in double figures with 16 points and five boards. Point guard Marcus Smart also had a solid afternoon for his team, as the rookie had 11 points and six boards. Up next, the Cavs will take on the winner of the Chicago Bulls vs. Milwaukee Bucks matchup. Currently, the Bulls maintain a 3-1 series lead over the Bucks with Game 5 scheduled for Monday night at 8:00 pm ET. The contest, which will be played at United Center, will be broadcast nationally on TNT.